Today we let loose a new feature called Zooniverse Groups. We’re always being told how our projects are used by schools, open evenings and other groups of people. This is great, and we encourage the use of our projects in education. We are often asked by teachers if it is possible for them to manage a group of students and keep track of their classifications. Today’s release is the first step in allowing this type of management by educators and others who want to share the Zooniverse. You can access Groups from your account settings on Zooniverse Home. 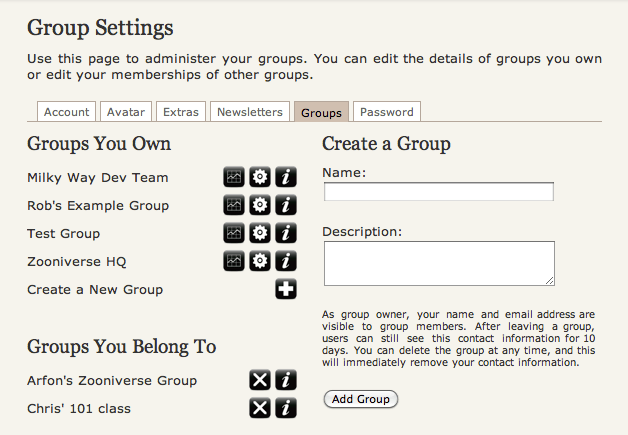 By default you will see the options to create a group. You do this by by giving the group a name and quick description. Once a group has been created (you will be the first member) you can then invite others to join in. You do this by viewing the group’s settings page (the cog icon next the group’s name). Here you can invite people, either by knowing their Zooniverse user ID, or by sending them a unique group link. As an example, if you follow this link – http://www.zooniverse.org/account/new?group=ab55cbbd – you’ll join my example group called ‘Rob’s Example Group’. If you already have a Zooniverse ID you can then sign in and join the group, or you can create an account and join as a new Zooniverse user. As the owner of a group you can see how many classifications each user has made since joining the group – and we have provided a couple of charts showing this data. We’d really like to hear from you about the other features you’d like to see included as a group owner. As a group member you get to see who else is in the group and the contact details of the group owner. Note to group owners: your email address is shared with members of the group. Groups currently only tracks your Galaxy Zoo activity. We had to start somewhere and we get the most requests for groups from schools using Galaxy Zoo. We plan to add in support for other projects as time goes by. Group members can leave a group at any time, and group owners can remove members at any time. Group owners can delete a group at any time and this will delete all membership records – we don’t store your group activity after deletion. Groups is in an early stage and we’re keen to hear what else you’d like to use it for. If you have feedback please get in touch via team@zooniverse.org. I was just wondering why it only counts the galaxy classifications which belong to the group since I created it. At the point of this post, I have classified 415 galaxies, yet on the group it states only 92.